Yesterday, Yelp sent OpenTable's stock dropping when it announced plans to roll out its own free reservation service for restaurants. There are many good business reasons for Yelp to do this to encourage more businesses to work with them. I'm most interested in how this can Yelp tackle its online-to-offline conversion or sales attribution challenge. Lots of people use Yelp's website or app to find a restaurant. I know, as a consumer, I do and find it indispensable when I travel. But if I was a restaurant owner (and a Yelp target customer), how would I know how effective Yelp is in driving foot traffic or calls to my restaurant, which are my primary KPIs? Back to me as a consumer...I often find something I like and look at the map and go. And when I get to the restaurant, I usually don't mention anything about how Yelp led me to them. This leaves Yelp dealing with how to measure online-to-offline conversions -- one of the hardest things to do in marketing! Let's look at Yelp's tracking options. Page Views: One of first generation online KPIs, page viewings of a business listing is easy to measure by Yelp, but it is really table stakes and insufficient to track conversions, especially if you're trying to convince a business to pay for advertising. Referrals to business's website: While it's easy for Yelp to track clicks to the business's website, this is only marginally better than tracking page views of the business's profile page. Many don't have a website and if a lot of them have horrible ones that quite frankly are better off with their Yelp page. Also, if your goal isn't e-commerce, then you're not getting any closer to the end goal KPIs. Phone Calls: Tracking phone calls from a user viewing the business listing would be great and a step closer to conversion. With mobile click-to-call tracking, it's easy to prove to a business the number of calls made from the Yelp listing. However, this is harder to do on a desktop/tablet experience as most people don't click-to-call from these devices. And the typical way to track these phone calls would be to get vanity phone numbers that redirect to the business's actual phone number. But Yelp can't really show a vanity phone number for businesses because that would confuse consumers who use Yelp like the Yellow Pages and expect them to display the actual phone number of the business. Lucky for Yelp, many of its users are using their mobile app instead of the desktop site so phone conversion tracking is likely getting better. Get Directions or Map Clicks: This is a common KPI used by retailers and is a proxy or leading indicator of user's intent to visit a store. But just because someone wanted to see how far away you are doesn't necessarily mean s/he actually visited your business. So, it's not great. Check-ins: This is one step better than Directions/Map Clicks because users self-report actually being at your business. Don't know what percent of Yelp users actually check-in to places. I don't. 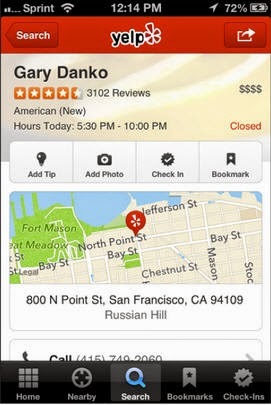 But businesses and Yelp could also incentivize users to check-in more by rewarding users if they do so. I've seen these offers on Yelp in the past. It's a good way to track foot traffic. In the future, iBeacon technology could improve this or the business can recognize you (or your mobile device) when you walk in, but it may also get creepy for consumers if they're not aware of such tracking. Exclusive Online Offers: This is an old stand by. Create an exclusive offer that is only available from Yelp (it doesn't have to be tied to the check-in idea above) and prospects must physically redeem it at the point of sale. Then you track redemptions and could build a model to estimate the online-offline conversion rate for extrapolation. The cost of the offers would be in the name of research and analytics. Reservations: So, getting back to yesterday's news, online reservations aligns perfectly to a restaurant's primary KPI. If you make it free, then more businesses will claim their business and use it. That then helps Yelp with their attribution problem. That then helps Yelp convince businesses to spend more on advertising on them. So, I can totally appreciate their tracking issues and applaud their move to offer free online reservations to improve conversion tracking.